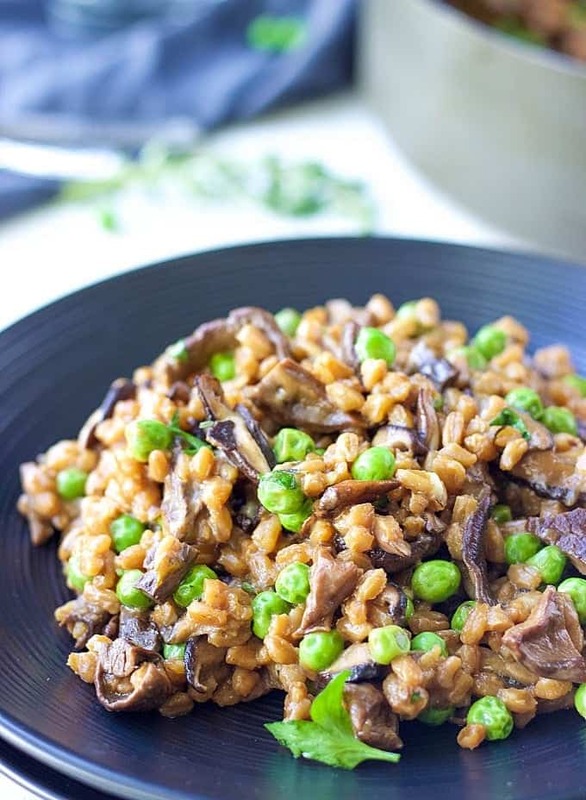 Hearty and healthy vegetarian dinner that features Farro, Porcini and Shiitake mushrooms. Burst of flavors in a one simple dish. Have you heard of Farro? Well, I haven’t until just recently. I was watching Today Show and one of my favorite chiefs Giada De Laurentiis cooked a dish served in her famous Las Vegas restaurant. It was Farrotto or Farro Risotto. Since regular risotto is on my go-to list for quick and delicious dinner recipes, (take this One Pot Chicken Risotto), I figured I need to give Farrotto a try. What’s also cool about Farro is that it extremely healthy. With all my love to rice, Farro beats it by nutritional properties. It has lots of fiber, protein and other important nutrients. Farro has slightly chewier than rice texture, mild nutty flavor and taste. I love it already and hopefully I will make more recipes featuring this healthy grain soon. I’ve had dried Porcini mushrooms laying in my pantry for too long. And I almost forgot about them. So, I figured that Farrotto would be a great way to incorporate them since Porcini are the kind of mushrooms that are bursting with flavors. For some reason they are not very popular in the US, but in Ukraine where I grew up, you can find Porcini everywhere and so many recipes feature them. Before working with Porcini, make sure to soak them in a cup of boiling water for 30 minutes. That way they will soften and cooperate during cooking. Farro requires slightly more cooking time, but the result is totally worth it. Hearty dish, with decadent flavors that you can’t pass by. 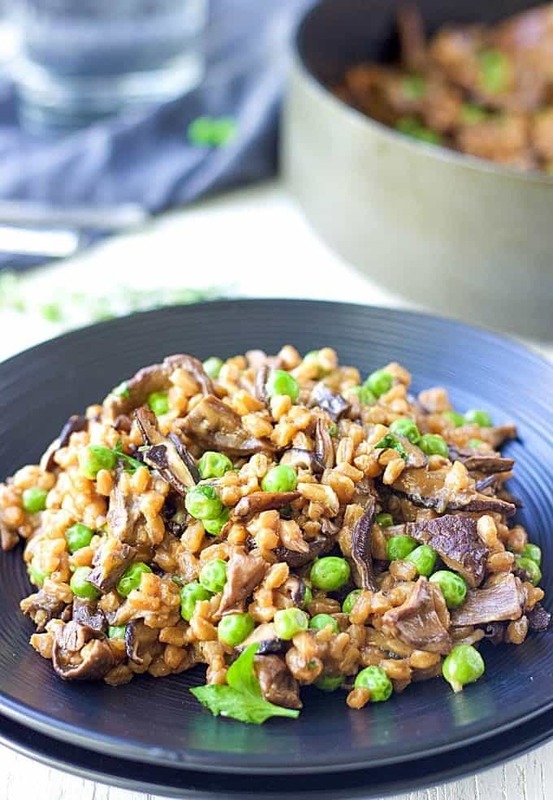 Pecorino Romano cheese adds that extra kick that makes this Farro Risotto stand out making it the ultimate healthy comfort food dish for the whole family. In a small bowl, soak Porcini mushrooms in a cup of boiling water until softened, about 30 minutes. Drain and reserve the mushroom water. Coarsely chop the mushrooms. Heat 2 tablespoons of olive oil in a large sautéing pan and on the medium heat. Add onions and cook until translucent, about 5 minutes. Add garlic and cook for 30 seconds. Add Porcini and Shiitake and cook for 15 minutes until Porcini have softened. Transfer cooked mushrooms and onions to a bowl and set aside. In the same pan, heat 1 tablespoon of olive oil, add Farro and cook for about 1 minute. Add white wine and cook for about 3 minutes until it evaporates. Stir in 1 cup of vegetable broth and mushroom water. Season with salt and pepper. Reduce the heat to medium low and cook until broth is absorbed. Continue adding broth ½ cup at a time, stirring occasionally until Farro absorbs all liquid and is cooked through, about 30 minutes. Stir in frozen peas, cooked mushrooms, Pecorino Romano and Parmesan. Cover with a lid and cook for another 1-2 minutes until peas have softened.